In 3-quart saucepan, place water, piloncillo, cinnamon sticks, anise stars and whole cloves. Heat to boiling, stirring with wooden spoon until piloncillo dissolves. After 5 minutes, add sweet potatoes. Reduce heat; cover and simmer 40 to 45 minutes. Remove and discard cinnamon sticks, anise stars and cloves. Reserve syrup. Serve sweet potatoes topped with reserved warm sweet syrup. Garnish with milk. Piloncillo is Mexican dark sugar that is unrefined and has a high molasses content. You can find it at specialty supermarkets that carry Mexican products. Brown sugar can be substituted for the piloncillo. Try serving this dish with its own syrup and drizzled with a little sweetened condensed milk. 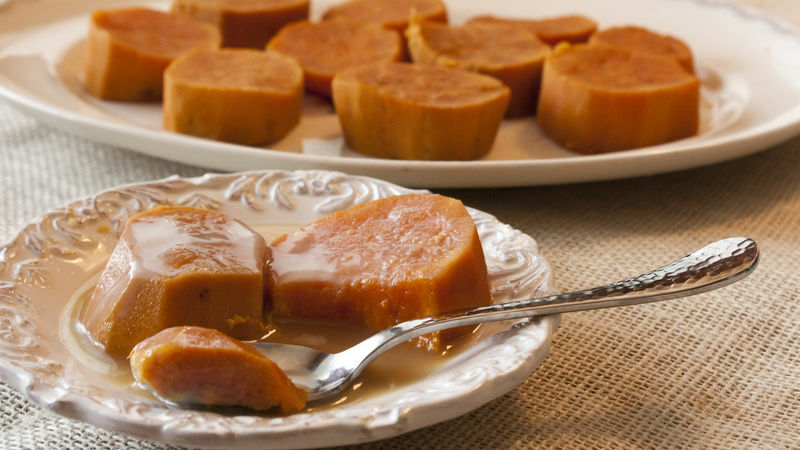 This recipe can also be made with pumpkins or squash instead of the sweet potatoes. You can eat this dish warm or you can let it cool, refrigerate it and eat it cold. It will keep in the refrigerator, covered, for a week.